If you liked PINKS ALL OUT then you're going to Love ALL OUT Live! The producers of PINKS ALL OUT brings you ALL OUT Live. Heads up ALL OUT style racing is coming to Lone Star Motorsports Park. With multiple ET race classes and the addition of motorcycles, there are more chances to compete and win prizes. The addition of our new segment THE CALL OUT brings some of the top grudge matches to ALL OUT Live events. Special CALL OUTS include racers that have appeared on the popular TV show Street Outlaws(r) . All events will be broadcast via Live Stream and recorded for broadcast television on MAV TV and REVN TV. Come Join the Worlds First Live Drag Racing Televised Game Show! The producer of PINKS ALL OUT® brings you ALL OUT Live®. The ALL OUT® style of racing created some of the most exciting competition for grassroots racers. From this style of drag racing we've created the worlds largest drag racing game show! NOT Pinks All Out®, something much Bigger and Badder, its ALL OUT Live®. The ALL OUT Live format gives everyone in attendance more chances to participate and win! With interactive fan participation and multiple ET classes, everyone in attendance has a chance compete for big prizes during a Live Taping of the show. We've added a special segment called THE CALL OUT®. Featured racers that have appeared on the popular TV show Street Outlaws will be accepting Call Outs from local area racers. THE CALL OUT starts online and ends face to face in front of the ALL OUT Live fans. All events will be view-able online via Live Streaming, Roku and recorded for cable and broadcast television airings on MAV TV and REVN TV. However, racers all this will take one thing to happen...Your Entry! A minimum racer entry is required to activate each event. So racers when registration opens sign up, just $20 deposit holds your spot! Once goal is met you will be sent a final payment email, you will have 30 days to make the final payment and lock your spot. If minimum entry goal has been met and you don't complete the final payment within allotted time you will forfeit your $20 deposit, no refunds will be honored. If the entry goal has not been met by cut off time you will be refunded your racer entry deposit and any merchandise purchased. Please make sure you have your funds in place and your ready to race! 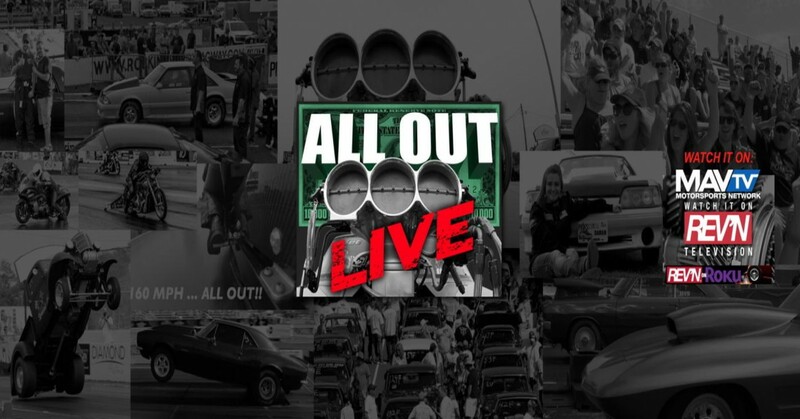 All Out Live entertainment and Boss One Media llc® along with our host tracks and sponsors have no affiliation with MavTv®, RevnTV®, Roku®, Fox Television®, Pilgrim Media® group, Pilgrim Studios®, Street Outlaws® or Discovery Communications®. All logos and registered trademarks are property of their registered owners.